Nectarines are rocking my world right now. As the summer weather comes to a close here in New Zealand, orchards and gardens are heaving with delicious fruit, ripe for the picking. Nectarines have always been my most treasured of the stone fruit bunch. Sweet yet tart, soft with a bit of bite, I often mourn their presence when supplies slowly dwindle after summer. I’m making the most of them while I can and I suggest that you do as well if you are living in this part of the world. Nectarines are a super food star as they are high in beta-carotene, an antioxidant that converts into vitamin A, which helps keep your skin radiant and teeth strong. They are also high in vitamin C, which is essential at this time of year to protect your body against sickness; as well as fibre and potassium, which ensure the body is functioning optimally. The addition of orange blossom water instantly takes me back to my time in the Jordan and the wonderful way that traditional Middle Eastern delicacies use a hint of a floral fragrance to transport you somewhere exotic and far away. Much time was spent wandering the different neighbourhoods of Amman, soaking up the sights, scents and sounds of the Old Town, popping into eateries when I needed to be refreshed, creating some of my most perfectly enduring food experiences. I treasure these memories, when the Middle East was much more peaceful and stable, and live in hope that this harmonious state will return. The key to using orange blossom water (and rose water) is to use it sparingly – you want a subtle hint, not an extreme sensory punch. Orange blossom water is widely available these days, in the international section of the supermarket, delicatessen or Middle Eastern store. Making a chia-based jam is a healthy way to get your jam jamming as the chia seeds “gelatinise” when mixed with liquid, so the jam doesn’t require a thickening agent like pectin or an immense amount of sugar to set, as is the norm with a traditional jam. This lusciously floral fruity jam freezes well and will last for about two weeks in the fridge. Blanch the nectarines until the skins split (about a minute or two). Refresh with cool water and peel. Chop the nectarine flesh into small pieces, transfer into a saucepan and slowly bring to a simmer. Cook for 5 minutes until the fruit starts to break down and become syrupy. Add the coconut sugar, orange blossom water and lemon juice and cook for a further 5 minutes. You can make the jam as smooth or chunky as you like by mashing the mixture until it is the desired consistency. Take off the heat and stir in the ground chia seeds and allow to thicken. It will become obviously thicker at this point (and slightly more once fully cooled), but if you would like a thicker consistency, add an extra teaspoon of ground chia seeds. Transfer into glass jars once the jam has reached room temperature and pop into the fridge. Enjoy the jam on toast with lashings of butter or on Greek yoghurt, ice cream or creamy dessert. *You can use normal chia seeds, but I prefer ground when making jam as the chia seeds blend into the mixture better. I feel pretty damn lucky to be able to experience the best of the summer seasons in both the Northern and Southern Hemispheres and really do make the most of the summer provisions. Currently at the markets, nectarines, plums, peaches, melons, berries and avocados are all in abundance, so I’m happily concocting delightfully fruity combinations like this summery salad to share with you here in the warmer climes. For those in the deep south, summer is just around the corner, so sit tight and watermelons will soon show their bright faces again. Watermelons are peaking right now here in beautiful Berlin – juicy, sweet and oh-so-lecker, I just can’t get enough. Watermelon really is the bees knees. It is a super satisfying fruit which quenches thirst, the perfect fodder for cruising down the canal in a blowup rowboat on a bright, sunny day. It is an excellent source of vitamin C, which assists the body in fighting infection (a bonus if you happen to fall in the canal). It is also especially good for men as it has a generous dose of lycopene, a cartenoid which not only assists in keeping the prostate gland in tip-top shape, it is also beneficial to cardiovascular health. As you may know, I’m staying in Neukölln, a highly eclectic area of Berlin with an array of cultural diversity and naturally, all of the foodie delights that come with it. In actual fact, it seems that anywhere in Berlin you can’t swing a shopping basket without hitting a Middle Eastern kebab shop, Greek restaurant or Turkish supermarket. If I’m eating out, one of my favorite dishes has to be anything with fried halloumi, whether in a kebab with felafel or as the pièce de résistance atop of a salad. Fried halloumi is something of a revelation for me. I’ve only recently discovered just how easy it is to cook this “squeeky cheese” and how it is the perfect accompaniment to so many things, as the salty richness lends itself perfectly to the sweetness of fruit and sweeter vegetables like capsicum, tomato and beetroot. It also provides a hearty dose of calcium which is fundamental to bone development, plus protein which is good for rebuilding muscle after a strenuous day rowing. Due to the robust texture and strong flavor of Halloumi, a little really does go a long way, so it’s possible to cut down on the high fat content and earn extra health points by reducing calories from fat where possible. So, celebrate the last of the summer sun by grabbing your paddles and heading out on the canal for an afternoon of swan spotting whilst devouring this lush salad. Heat a frying pan to a medium temperature and toast the pepitas until lightly browned, moving them around the pan often. Coat the pepitas in tamari, remove from the heat and transfer to another dish to cool. Wash and dry the pan and place back on the heat. Add a good glug of olive oil to the pan and allow to heat. Cut the halloumi into small slices (about 1/2 cm thick) and place in the pan. Fry until golden brown and flip over to brown the other side. Remove the rind of the watermelon, cut into rustic pieces and remove the seeds where possible. 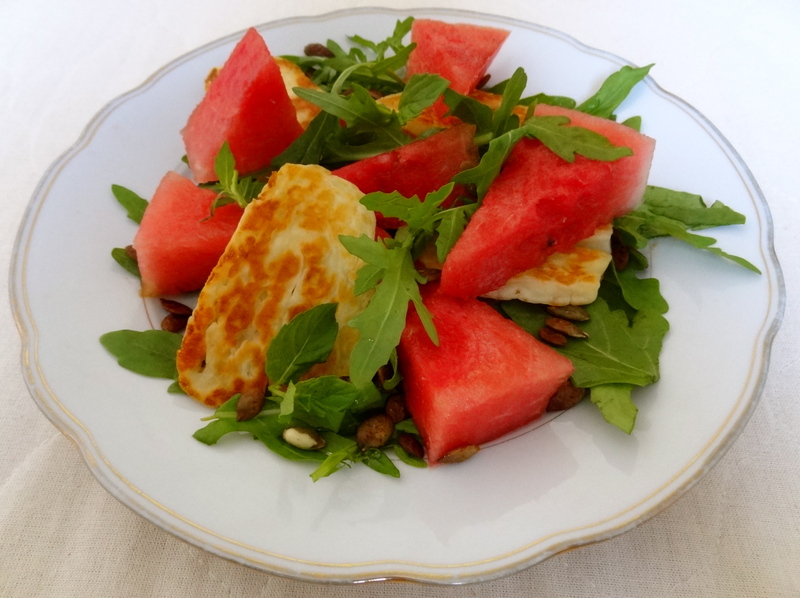 Arrange the rocket, mint, watermelon and halloumi onto a large serving plate or smaller individual plates. Mix the lemon juice with a good glug of olive oil and drizzle over the salad. Sprinkle with tamari toasted pepitas and season with Himalayan rock salt and pepper. Serve immediately while the halloumi is still warm. Guten Appetit, meine Lieblings! The locale of Neukölln where I’ve recently been residing, is home to the largest mosque in Berlin and a considerable population of people of Middle Eastern descent. As Ramadan is over for another year and the celebration of Eid ul-Fitr (Eid) is in full swing, there is great excitement in the air, a Christmas summer holiday-kinda feeling, where hanging lanterns festoon windows and shop fronts are adorned with bright, kaleidoscopic decorations. The Muslim holiday of Eid ul-Fitr, literally translated as “festivity of breaking the fast”, signifies the end of Ramadan, the holy month on the Islamic calendar where Muslims refrain from eating, drinking and sexual relations during daylight. Ramadan is a time of intensive sacrifice and reflection, where empathy for others less fortunate is expressed through acts of generosity and charity. It is also a time of reconnecting with friends and family during the evening meal, Iftar. The warmth and connectedness continues to be celebrated during Eid, when loved ones gather together for a few days of lavish feasts and merriment. Dates are considered very important at this time and during the month of Ramadan they feature in daily rituals. An odd number of dates (usually three) are consumed after sun down with a glass of water to break the fast and will unquestionably star in a dessert during Iftar later that evening. During Eid, they are also given out as presents. What I love about dates, especially the Medjool variety, is that they are like eating a healthy caramel. They are so naturally sweet and satisfying, that eating one or two will kick any mid-afternoon sugar cravings to the curb. Dates are an excellent source of fibre and are also surprisingly rich in protein – evidently 5 times more than other fruit. They also contain 15 different minerals including zinc, iron, magnesium, potassium, sodium and phosphorous. Basically, they are wee powerhouses of goodness. When I lived in Jordan, one of my beloved pursuits was to visit the sweet stores, especially during Ramadan and Eid. There were so many delicacies on offer, tantalizing combinations of dried fruits and nuts, usually with an aromatic hint of rose or orange blossom. It was here that I first encountered stuffed dates and I was instantly charmed as they’re my kind of sweetie treatie – naturally healthy and bursting with super sweet flavor. 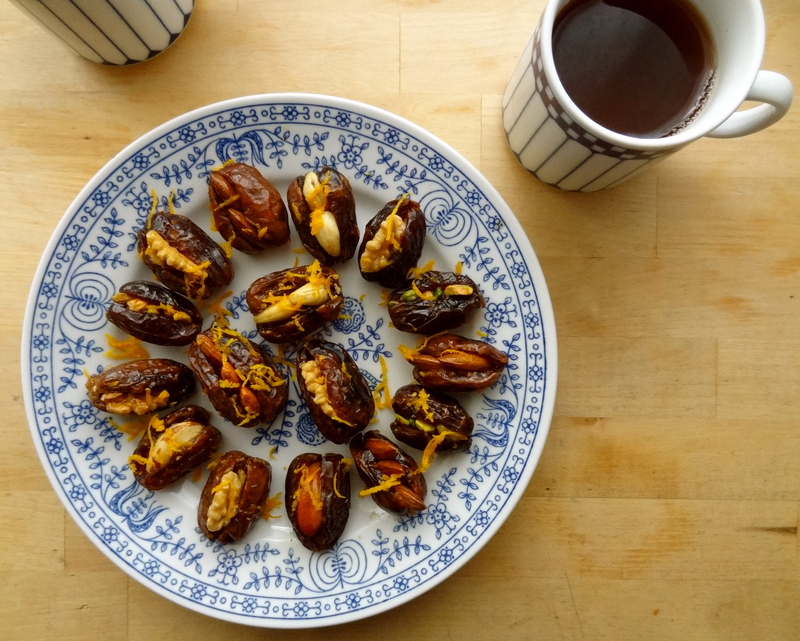 This is my take on stuffed dates, which are the quintessence of good times and celebration. Eid Mubarak! In a small saucepan, slowly bring to boil the water, honey, orange-blossom water and cinnamon. Allow to boil for a couple of minutes, stirring often, then set aside to cool. Split the dates open and remove the pit. Set the nuts into the dates, with the nuts resting lengthwise. With a pastry brush, generously glaze the stuffed dates with the syrup. Pop in the fridge for at least 30 minutes for the glaze to set. Arrange on a platter and sprinkle the orange zest over the stuffed dates. Enjoy at any time of the day or night, with rose tea, coffee or as a celebratory sweetie-treatie. Note: There will probably be some left over syrup, which makes a great accompaniment to yoghurt. * Orange blossom water can be found at all good delicatessens or Middle Eastern food retailers. Much like the scent of a rose in bloom is one of life’s pleasures, devouring a rose-scented pudding is also a delight for the senses. This dish is Middle Eastern inspired, however instead of using the traditional pistachio nut common in Eastern sweets, I’ve added macadamias for a contrasting texture. The ease of preparation is a bonus with this dish and it is perfect for entertaining, as it can be prepared a few minutes before the guests arrive and left to chill in the fridge. 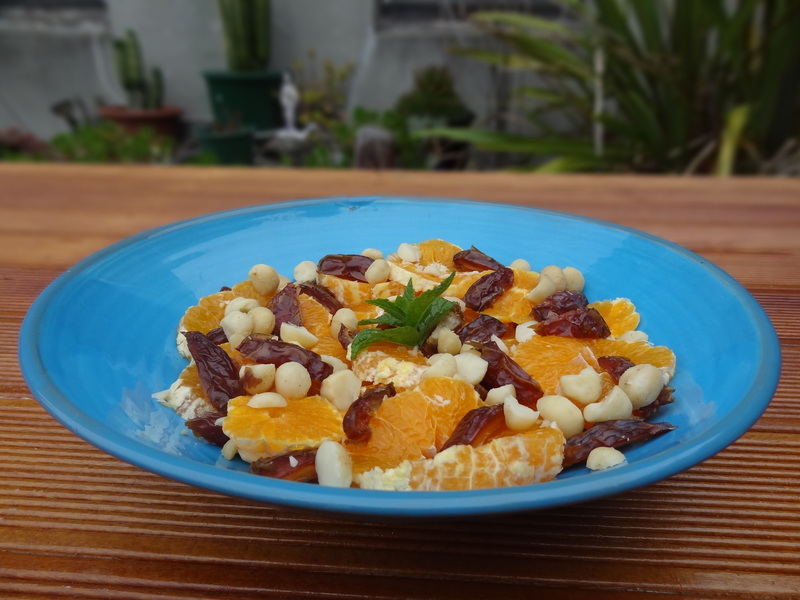 This fragrant dessert is light, nutritious and the perfect way to end a meal, as the oranges have a high concentration of vitamin C, which will boost the absorption of iron from the main course. Macadamias are a good source of protein, potassium, calcium and dietary fibre and also provide a buttery richness which round this dish off perfectly. Yummo. Using your smallest and sharpest knife, slice around the orange to remove the pith and the flesh. Slice the oranges into rounds, reserving the juice. Quarter the dates lengthways and remove the pip. Arrange the orange rounds and dates in a serving bowl. Mix the reserved juice with the rosewater or rose syrup and drizzle over the oranges and dates. Cover and chill for 30 minutes. Sprinkle over chopped macadamias just before serving. Watch your guest’s eyes light up when they taste this delectable dessert and give yourself a pat on the back. Baba Ghannouj, or “Poor Man’s Caviar” is quite possibly the most delicious food I’ve ever tasted. 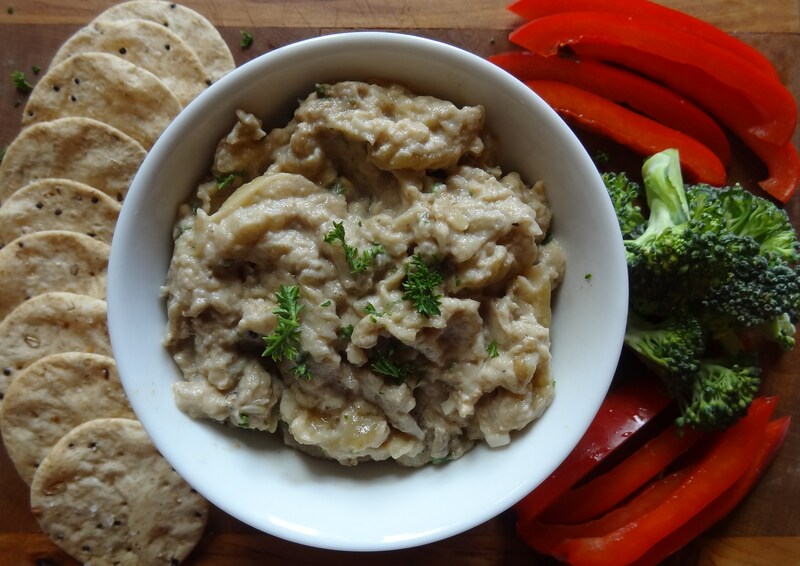 I first started making this delectable Middle Eastern dip when I worked at Kimi Ora, the health resort in Kaiteriteri and it’s been a firm favourite ever since. I believe the best cooking method is to crank up the barbecue and char the eggplants until they are wrinkled and blackened, which adds a smokey depth of flavour that permeates the dish. Alternatively you can grill or roast the eggplants. Not only delicious, Baba Ghannouj is also equally nutritious. Eggplants are low in calories, rich in soluble fibre and are a good source of minerals such as iron, copper and potassium. Tahini, which is a paste of finely ground sesame seeds, is also rich in vitamins and minerals, including methionine, an essential amino acid and lecithin, which reduces fat levels in the blood and protects against environmental toxins. Tahini is 20 percent protein and is a rich form of calcium, which makes it a superfood star, especially for those partaking in a vegan or dairy-free diet. Tahini also comes in two different guises – one made from unhulled sesame seeds which is darker, has a stronger flavour and is richer in nutrients. The other is from hulled sesame seeds, which has a subtler flavour and is what I personally think works best in this dish. Pierce skins of the eggplants in a few places with a fork. Grill eggplants on a very hot, well-oiled pan, turning them often, until they are shriveled and soft. When the eggplants are cool enough to handle, split them open and scoop out the flesh. In a food processor, combine the garlic, lemon juice, tahini, rock salt and cumin (if desired). Blend until smooth. Add parsley and pulse a few times. Drizzle lightly with olive oil and garnish with chopped parsley. Serve as a dip with crudites (raw vegies cut into bite-sized pieces) and wholegrain crackers.